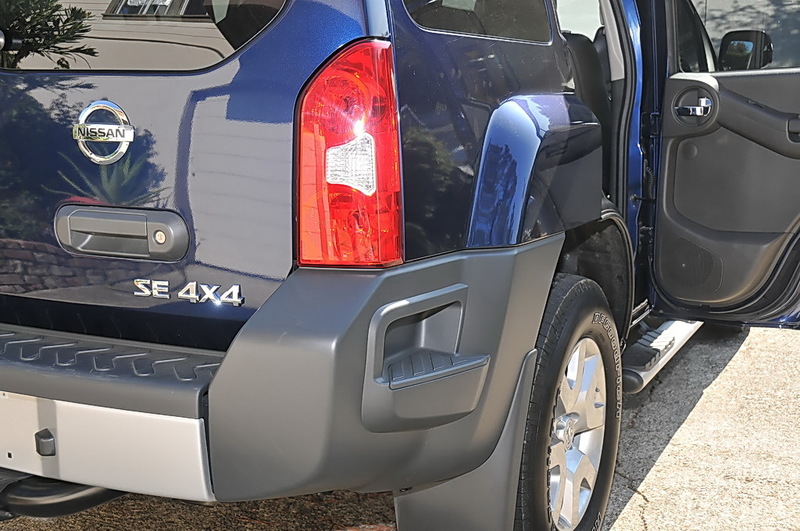 The Xterra has grown over the years and the 2009 version has the capability to haul a lot of cargo with flexible cargo options, as well as being better refined for everyday driving. I used it to move my belonging’s from a storage facility, commuting to work, and driving a friend around San Francisco. For all that I did, the Nissan proved to be a multi-talented SUV. The second generation Nissan Xterra receives a number of enhancements for the 2009 model year – including a redesigned front end appearance, new roof-mounted off-road Lights (Off-Road model only), new wheel designs, new seat materials and colors (with leather-appointed seats standard on SE models), new trim level content and standard roof-mounted curtain side-impact supplemental air bags with rollover sensor for front and rear-seat outboard occupant head protection. The version I was privileged to drive was the SE-V6 4×4 that included the Technology Package (a $1,300) value for no additional charge. The 4.0 liter V-6 is mated to a 5-speed automatic transmission with a switch-operated 2-speed transfer case that kicks in the 4WD on demand. Outside is the roof rack and integrated storage tray (behind the front cover/wind deflector) as well as larger, aluminum 17 inch alloy wheels, tow hooks (not yet installed), step rails, tow package and fog lights. The main differences on the inside compared to the lower trim models are the auto-dimming rear view mirror, leather-appointed seats, leather-wrapped steering wheel, first-aid kit, and titanium-colored gauge accents. For an SUV, I was pleasantly surprised by how easy it was to drive. Especially on the freeway where, even though it’s a good sized truck, I found it to be nimble maneuvering in and out of traffic. Peripheral vision is excellent due to the high vantage point and lots of glass making it easy to drive and park throughout San Francisco. When pressed, the engine is a bit noisy, but at cruising speeds or normal driving, it remains quiet (not Lexus quiet, but truck quiet). When the roads did get a little rough, the unloaded Xterra bounced around a bit, but less so than the smaller Honda Element that I drove earlier. Possibly the extra weight of the Nissan accounted for the difference in ride quality. Fully loaded with gear, the suspension calms down and the ride is quite supple. Driving at night, the headlights produce a blanket of light with no hot or cold spots. For a limited time, beginning at the 2009 Xterra’s sales launch in July 2008, the content of the Technology Package – including an advanced Rockford Fosgate® audio system, XM® Satellite Radio, Bluetooth® Hands-free Phone System, steering wheel audio controls and auxiliary input jack – will be provided at no charge with every 2009 Xterra S, Off-Road or SE. Definitely take advantage of this offer as I highly recommend the RF system as the music produced is down right LOUD !!!! While it plays loudly, the sound remains clean with a detailed midrange and extremely tight and punchy bass. Blasting Justin Timberlake’s “SexyBack,” its electronic bass line massaged my lower back via the thumping subwoofer. Awesome. I had to turn the music down because it was getting painful to listen at those levels. Nissan does a great job of manufacturing a quality truck free of rattles constructed with quality materials that will no doubt last a while in this workhorse. All of the doors close with a light touch, and I never had to re-open a door to close it completely. The rear seat cushions can be removed completely by releasing two levers per cushion allowing the seat backs to fold completely flat. The mechanisms easily disengage, and securely hold the cushions in place in normal use. One pet peeve was the release strap for the larger cushion ,that had slipped between the seat back and the cushion, that took about five minutes of fishing before I was able to pull it out. The easy to clean, plastic surface material in the cargo area is also on the seatbacks of the second row seats for a contiguous hard surface if the seats are folded flat. Checking vital fluids is simple as all vital dipsticks or fluid levels are easily accessible. I found it challenging to find the perfect seating position in the driver’s seat. With only two knobs for adjustment, you’re limited: the forward-most knob adjusts overall seat height while the rear-knob adjusts seat cushion angle pivoting from the front of the seat. Needless to say, a few twists and I found something that worked and in the long run wasn’t that uncomfortable despite the flat cushions. Layout of the controls are well thought out and everything is clearly labeled with white-on-black text or icons. The perforated leather-wrapped steering wheel is the perfect thickness and the steering wheel controls for both audio and cruise are easily reached. Looking at other center consoles overloaded with buttons and acronym-based features, the Nissan dash is comparatively uncluttered. One thing that I did notice at night when I had the fan “on”: the dial indicator light on the perimeter of the knob is the same color as the A/C indicator in the center of the same knob. A few times, I mistakenly pressed the A/C button thinking it was “on” (when it was not). Also, the chrome rings around the fan and heat controls are a bit slippery if you have wet hands; it would have been nicer to have rubberized knobs for better feel/control. The rail steps (with a flat rubberized step on top) make getting into the SUV a bit easier for shorter drivers/passengers. The side HVAC vents can be closed with a dial knob below the vents, but the vents flanking the center console cannot be closed completely. This was only annoying when my wife wanted heat and I didn’t want any. It’s a fairly heavy vehicle, and didn’t expect too much performance from the 261-hp V-6 on 2+ tons of curb weight. I wasn’t wrong, but it’s not a slug either accelerating smoothly and confidently from a stop. At highway speeds, flooring the gas allowed me to zip in and out of traffic demonstrating the engine’s prowess at speed. Braking is smooth and strong, but the weight definitely factors into longer stopping distances so plan ahead. I expected the rather tall Xterra to be a bit top heavy, but the double-wishbone front and multi-leaf, solid rear axle both have stabilizer bars that quell body roll. For normal driving the suspension is compliant enough to absorb road irregularities and speed bumps. On the freeway, I could never remove my hands from the steering wheel for a moment as the truck tended to wander either right or left. The steering is speed sensitive, but it felt a little too boosted for my taste reducing my connection to the road. On the positive side, driving around town and making turns (no matter how tight) was a breeze. Pingback: Get a Free Roof Replacement in 1 Day! Very powerful even off-road. I have tested it in the sand. It was excellent on an intermediate difficult desert trip. Unfortunately both plastic rear mudguards have been broken. This is a design fault, they were too long and rigid for the deep sand. I was suprised, because I have the Off-Road version. I will try to get a warranty replacement since they are not listed as uncovered by warranty. Nissan should take a look at Toyota Prado mudguards. I like the steering wheel, it is not as heavy as the one of a Mitsubishi Pajero. All in all I love the car, it was an excellent choice to by. I don’t want Justin Timberlake thumping anywhere near my lower back. or at the very least build it here locally.